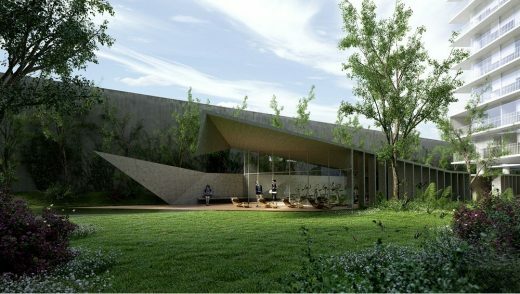 Zentral is located on a property with unusual geometry. It is a multiuse complex with offices, a shopping center, and apartments. Facing the Manuel Gómez Morín peripheral ring, Zentral enjoys a strategic location on one of Guadalajara’s main routes in the Puerta de Hierro neighborhood. Its soaring views of the city serve as a cornerstone for the project. 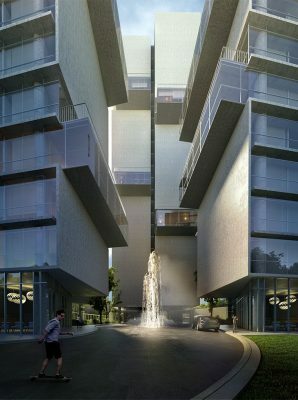 The entrance of the development broadens to reveal a set of three elongated towers that converge at the center of the property. 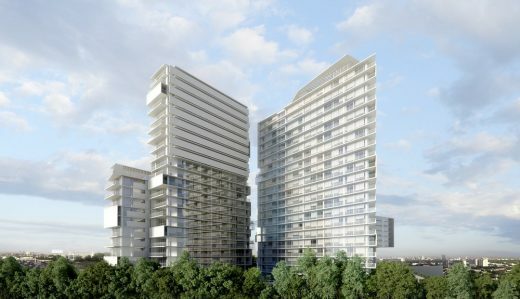 The towers are in close proximity but do not touch, creating a space for the entrance lobbies to the residential towers. The fan-like footprint serves to optimize the orientations and views without the towers blocking each other. 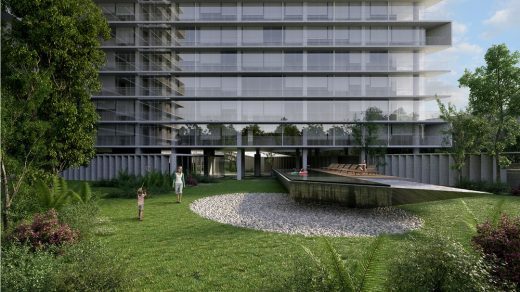 The widest section, furthest from the roadway, features an extensive garden around the buildings and provides a space for the amenities on the ground floor. To better serve the large number of homes and to avoid circuitous routes, each tower has its own amenities section on the middle and upper levels. 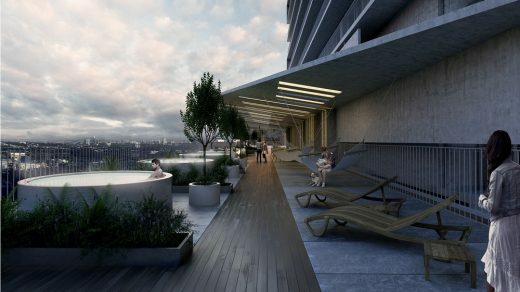 These common areas provide a space for community living enhanced by panoramic views of the city. 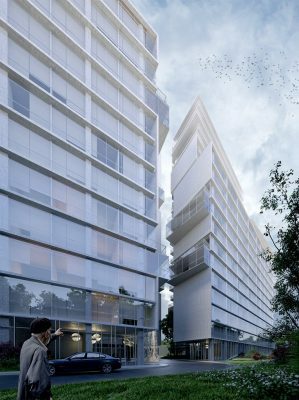 Zentral leverages the smaller side of the property – which provides access to the complex – that faces the city and features an iconic office building. The cantilevered upper section is supported by a single structural nucleus that forms a u-shape at ground level for businesses. This space, which forms a semi-covered plaza, serves as a public space and provides access to various services to meet the daily needs of the residents and users. Zentral is comprised of three 20-story towers and provides space for 429 apartments ranging from 79 to 114 sqm. Location: Puerta de Hierro, Guadalajara, Jalisco, México. Design team: Gustavo O´Farrill Ferro,Alfredo Monterde Alarcón, Adrián García García, Rodrigo Muñoz García, Rodolfo Romero Chávez.